Holiday side dishes, appetizers and baked treats are some of my favorite experiences during the holidays. And I have some special recipes planned to share with you over the next several weeks. 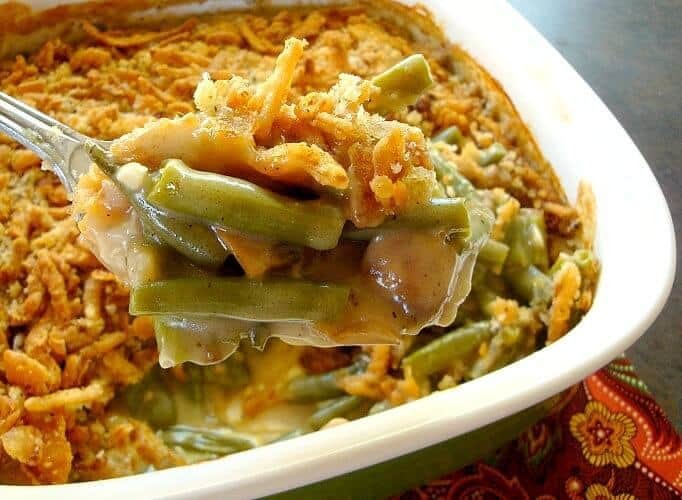 First up is the quintessential classic of many holiday tables, green bean casserole. I’m starting with this make-ahead version for a few reasons. First of all, this is a really good one that is traditional but more fresh than the well-known condensed soup version plus you can make this recipe right now and freeze it for up to two months! 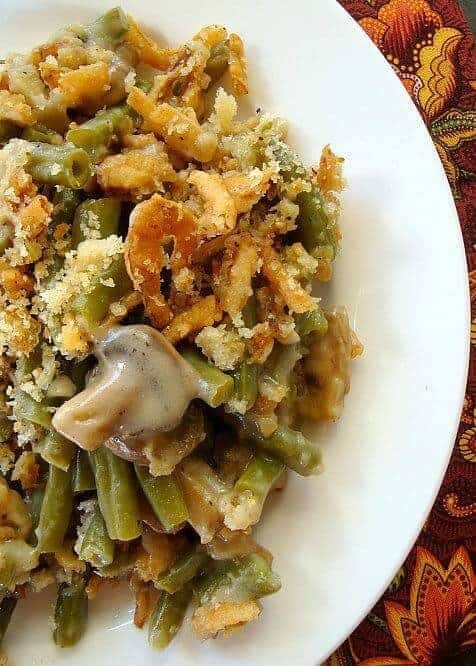 This green bean casserole combines fresh green beans and a homemade sauce that is silky, creamy and full of rich flavor. The fried onion topping gets even a bit more depth with fresh breadcrumbs (the printable recipe calls for white bread, but I’ve used an “everything” bagel, and even gluten-free bread with great results). Also, based on your preference, add some slivered almonds or water chestnuts to transform this stand-by into an elegant part of the meal. Why not make two and save one for your Christmas table? Or just have on hand for the perfect side dish to any cozy winter roast. Cook’s Note: If you don’t want to make this recipe ahead, but prefer to make and eat it the same day, I’ve added directions for doing that at the bottom of the printable recipe. For the topping: Pulse the bread, butter and salt in a food processor until coarsely ground, about 10 pulses. Combine the bread mixture and onions in a bowl, transfer to a large zip-lock freezer bag, and freeze for up to 2 months. For the Casserole: Melt the butter in a large skillet over medium heat. Add the mushrooms, salt and pepper and cook until the mushrooms release their liquid, about 5 minutes. Increase the heat to medium-high and cook until the liquid has evaporated, about 5 minutes. Add the garlic and thyme and cook until fragrant, about 30 seconds. Stir in the flour and cook until golden, about 1 minute. Slowly whisk in the wine, broth and cream and bring to a boil. Reduce the heat to medium and simmer, stirring occasionally, until the sauce is thickened, about 10 minutes. Toss the green beans with the cornstarch in a large bowl and transfer to a 13 by 9-inch baking dish. 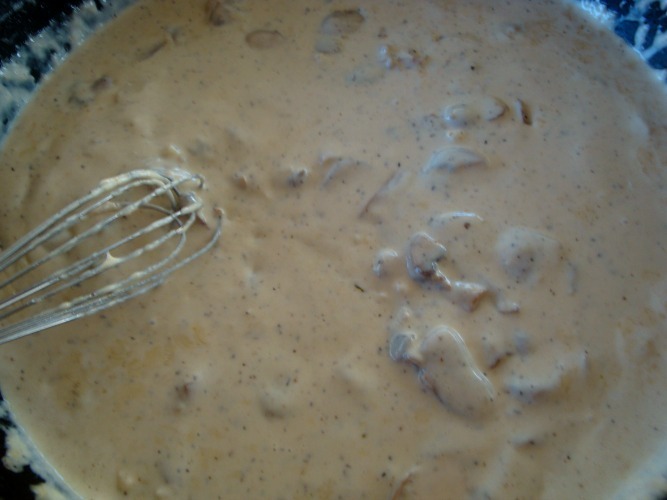 Pour the warm mushroom mixture evenly over the beans (do not mix). Let cool completely, cover with plastic wrap, cover with foil, and freeze for up to 2 months. To cook and serve: Remove the casserole from the freezer and take away the plastic from the baking dish and replace the foil. Adjust an oven rack to the middle position and heat the oven to 400 degrees. Bake until the sauce is bubbling and the beans are tender, about 80 minutes, stirring the beans thoroughly and adding almonds or water chestnuts after about 50 minutes. Remove the foil and spread the topping mixture over the beans. Bake until golden brown, about 8 minutes. Serve. 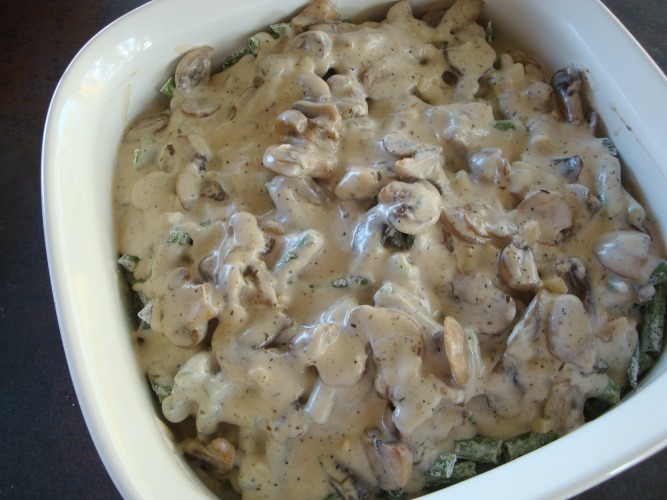 To cook and serve the same day this recipe is prepared: Once the mushroom mixture has been poured over the beans, (do not mix in) cover with aluminum foil and bake in a 350F degree oven for 60 minutes. 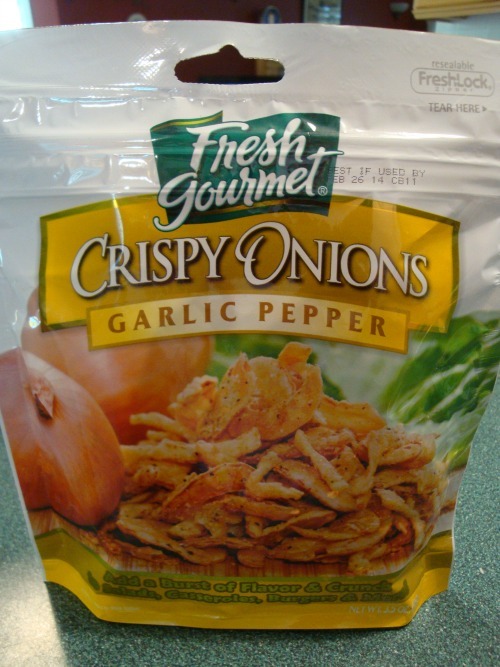 Remove foil, sprinkle fried onion mixture over top and bake uncovered an additional 10 minutes. Ready to serve! 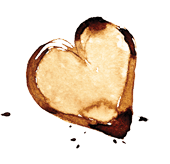 Note: If you're wanting a gluten-free option, use gluten-free bread where the recipe calls for white sandwich bread and instead of flour in the sauce, use cornstarch (start with only 2 tablespoons). Recipe adapted from The Best of America’s Test Kitchen 2010. I accidently mixed it before baking will it still be ok?? I’m worried about putting this frozen dish in a hot oven. will it explode? Hi Marcy, The time the dish sits on the counter while the oven is pre-heating will bring the pan temperature close enough to room temperature to be able to put in the hot oven. But I’ve also taken a Pyrex dish straight from the freezer to the oven bwfore with no problem. I noticed you mentioned using gluten free bread before. Have you replaced the flour with gluten free flour befor? Hi Danielle, I would substitute the flour with cornstarch. I’ll go in and add this information to the recipe. Thanks for the heads up. if i’m taking this to someones house, should I cook it ahead of time or just cook the whole thing there? Hi Marcy, You could cook it at your house and see if they’ll let you place the casserole in their oven just to re-heat when you get there. And if you’re making it today, I’d just place it in the fridge. Let me know if you have other questions! I already put it in the freezer. I’ll now place it in my fridge. My issue is I’m driving two hours. Should I cook it an hour, take it to my dinner, place topping on there and bake until heated through? I just finished making this casserole but I forgot and mixed the sauce and green beans. I’m going to go ahead and outbid in the freezer when it cools. What adverse effect have I created by mixing it up? So I had to drop by and thank you for posting this AMAZING recipe. My husband and I are overseas (greetings from Japan! ), and we hosted Thanksgiving for a handful of single Airmen he supervises since we’re all away from our families. Not only was this my first time ever hosting Thanksgiving, but we had a full house that night! I’m talking 12 full grown, hungry men! I was determined to give these boys a good, home cooked meal for the holiday, especially since for most of them, this was their first time away from home. I was in the Air Force myself for 4 years, and I knew how lonely it could be around this time of year. I made this the day before using frozen green beans coated in the cornstarch, and it worked out amazing. I also simply stored it in the refrigerator rather than the freezer, and it cooked up perfectly. Not watery nor rubbery at all! Let me tell you, while prepping that sauce, I nearly hit the floor when I tasted it. Ohhh my, this was way better than the canned-everything version that I always had, and the extra bit of effort it took to pull this together was so well worth it. I will NEVER go back. Hi, if I make this the same day do I partially cook the green beans before putting the casserole together and do I still use the cornstarch? Hi Michelle, Yes, every step will be the same except the cooking time. Enjoy, you will love it! Happy Thanksgiving. Thank you. Looking forward to it. Happy Thanksgiving! Can this be thawed to save on cooking time? If so, what would you recommend for cooking time and temp? Hi Giana, This casserole could be thawed overnight in the refrigerator and then I’d follow the directions at the bottom of the printable for making the day of baking. Essentially, bake covered for 60 minutes at 350F degrees, then an additional 10 minutes uncovered. Thanks, Sally! Excited to try it. Thank you for this great recipe! I am planning on making this today and freezing for next week. One question, what kind of wine would you suggest? Thanks again! Could you use the frozen whole green beans instead of fresh ones? Ginger, I haven’t used frozen in this recipe but I think they would work just fine. If you do use the frozen (so much less work! ), let me know how they turn out. I know it’s sacrilege . 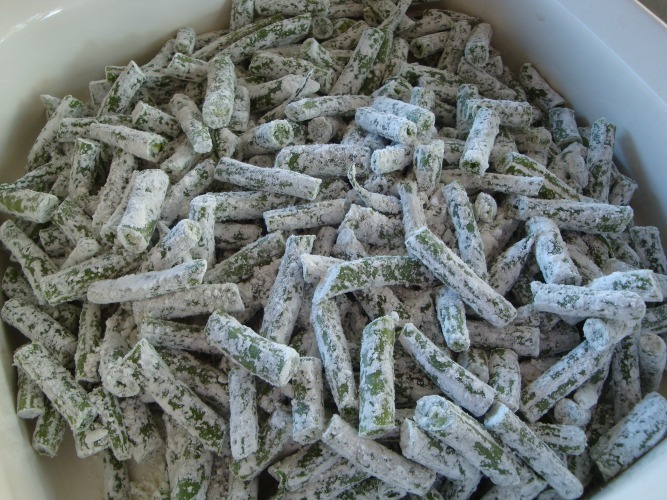 But could you use frozen green beans and coat with the cornstarch frozen? Hi Susan, I think cooking is all about experimentation. So go for it! Vegetables that are frozen are done so at the peak of freshness. Plus, that will cut a lot of time off your prep work. Great idea, actually. So, if I do the freeze over-night version and cook the beans, do you still coat them with cornstarch? Tracy, if you are going to freeze it, whether you precook the beans or not, I would still coat them with cornstarch. The cornstarch is meant to help with the moisture that will collect during freezing. This sounds delicious. I am thinking of making it the day before and not freezing it. Do you think that @400 I would cook it about 40 minutes? Thank you so much for the recipe. Hi Deb, If you don’t freeze it beforehand, I would boil the beans for about 4-5 minutes so they are cooked to tender but not too raw-crunchy when you cook it the day of. This will not make the beans too soft, I promise. If you make it the day before, you still can freeze it just overnight (if you have the room). This really is a great recipe and I think everyone will be happy with it. Thanks for trying it! Deb, I just realize I didn’t answer your question. Yes, I think 40 minutes at 400 degrees would work great. This was INCREDIBLE! I had never made (or even eaten) this because, well…..yuck, canned green beans and cream-of-something soup? And the fact that you can make this ahead and freeze it for busy holiday kitchens?!!!! WIN WIN WIN! Thank you for a fantastic recipe! I seriously cannot believe that you can freeze a green bean casserole! I am hosting Thanksgiving this year and so excited to get a jump start on it with this recipe already. Awesome! Stocking Your Pantry with Baking Essentials Week 4 – Chocolate!